Boteler Fire: Start 10/25/2016. 8975 acres. 51% containment status. Public Fire Info Meeting. 11/17/2016, Thursday @ 1900 hours. 1st Freewill Baptist, 259 Tusquittee Rd in Hayesville, NC. Bullpen Fire: NEW Start 11/15/2016. S of Highlands / Bullpen Rd. 5 acres. Initial Attack efforts in effect. Crews from Knob & Whitewater Fires moved to this fire. Dicks Fire: Start 10/23/2016. 728 acres, 95% containment status. Knob Fire: Start 11/2/2016. 1130 acres. 98% containment status. Muskrat Fire: Start 11/11/2016. 103 acres. 95% containment status. Tellico Fire: Start 11/3/2016. 13,679 acres, 74% containment status. Buck Creek Fire: 8 acres. Charley Creek Fire: 3 acres. Grape Cove Fire: 35 acres. Howard Gap Fire: 0.5 acres. May Branch Fire: 175 acres. Moses Creek Fire: 30 acres. 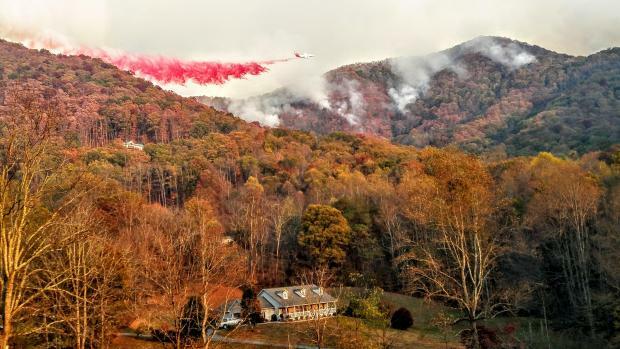 Moss Knob Fire: 7 acres. Ridge Gap Fire: 2 acres. Wine Spring Fire: 95 acres. Chestnut Knob Fire: 4600 acres.205 personnel. 30%contained. Fire Fact: The North Carolina Forestry Service in North Carolina is currently investigating all fires for arson. See something? Say something by calling 828-257-4200.